Big Sur Marathon Training: Week Ten | Fit Girl. Happy Girl. Monday: Cross training day- 50 minutes of Vinyasa flow yoga. I went to a vinyasa flow yoga class at the Energy Center at work. It was a bit more intense than usual which was good because it really felt like a workout. We did a lot of hip openers and hamstring stretches which was just what I needed after last week’s training. Tuesday: 7 miles easy in 1:03:00 at 9:09/mile pace. Wednesday: Double workout day, two runs for a total of 7 miles. Run 2 of 2 of the day for a total of 7.15 miles. I ran this one after work at the gym, on the dreadmill but it was good, easy and quick. I felt good the whole time. 30 minutes of strength training: arms, abs and hamstrings. Thursday: 6 miles easy in 54:00 at 8:58/mile pace. Saturday: 17 miles in 2:43:00 at 9:35/mile. This wasn’t the best run ever. My allergies were really giving me a hard time so breathing was a bit of an issue. I did everything I did last weekend for my 20-miler to prep for this one but it just wasn’t the same. At one point I contemplated cutting it really short because my hear just wasn’t in it. This taught me the meaning of “relentless forward motion.” Not every run is going to be great but if you can get it done that’s all that matters. Sunday: 4-mile recovery run in 35:00 at 8:45/mile. 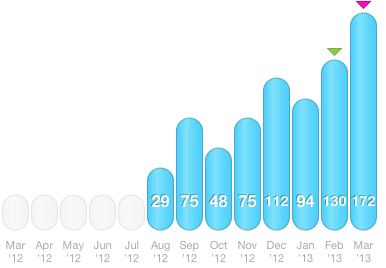 Weekly mileage total: 41 miles. Sounds like an awesome week of workouts! Nice job! You rock!! Thank you! It was tiring but great!! I’ve been through the wringer with allergy issues lately too. Hope you feel better soon! Nice mileage though! Thanks Karen! I never realized how much allergies would hurt my running but hopefully they’ll calm down soon! Great miles! Where do you plan to peak? You must be planning on a fast marathon with this type of training plan. That sounds good, you should do well. Best advice is to not go out too fast. It is easy to get caught up in the adrenaline! Have a great first marathon expereince! And don’t forget to buy that cool looking shirt or jacket. You only run your first marathon once.